There are film scenes that we love, and there are scenes that we loathe (or hate). As such, we like to celebrate the good ones and shame the bad ones. Today, it’s time to talk about a bad one. This is the scene from Batman Forever that causes us to involuntarily exclaim “I Hate That Scene!” whenever it is brought up in conversation, and that’s only if we’re being nice. 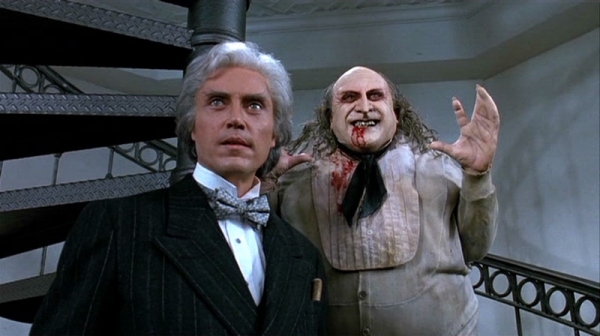 THE PLOT: After Tim Burton sent kids running away screaming with his ultra-grim Batman Returns, the franchise passed down to Joel Schumacher, who decided camp was the way to go with everything bigger and brighter. Michael Keaton told Schumacher it all looked great before pulling a classic point-upward-and-yell “Oh, my God! What the hell is that?” and sneaking away when Joel turned his head. So, Val Kilmer became the new Batman, agreeing to the role without having first read the script. As such, he might have had no idea that the plot involves Harvey “Two-Face” Dent (Tommy Lee Jones) and The Riddler (Jim Carrey) joining forces to take over Gotham City via a kind of mind-control device. Secondary to the main action is an origin story for Robin (Chris O’Donnell), Batman’s sidekick who similarly reacts to losing loved ones by donning tight leather and laying the smackdown on, um, laundry. There is also a hot blonde doctor (Nicole Kidman) who mostly gushes to Bruce Wayne about the ultra-dreamy Batman and inquires if Bruce could somehow get her number to Batman. We are exactly 25 minutes into the movie, and we’ve already suffered through a neon-heavy opening action scene involving Two-Face. Suddenly, they remember that we have no idea why the hell Tommy Lee Jones has half of his face painted an odd pink/purple mixture. o, we get Bruce watching a news report which contains footage (from where? Gotham City’s version of CourtTV?) 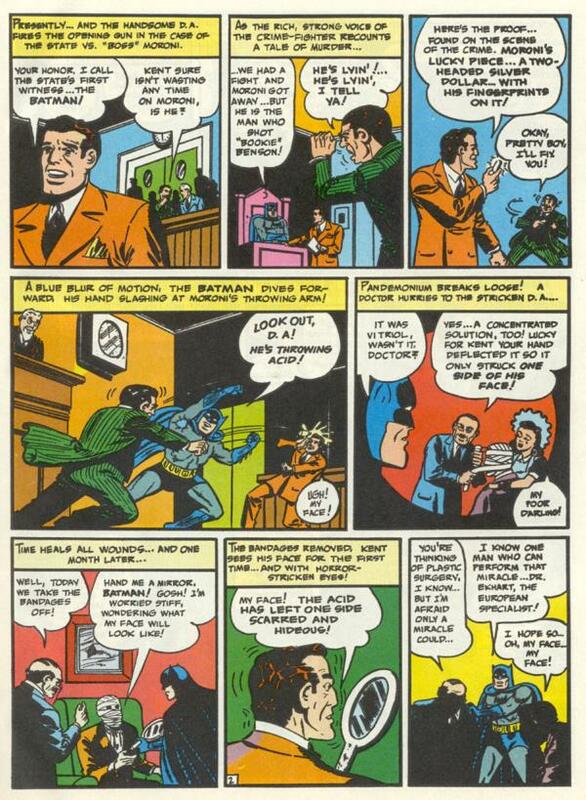 of that one time a mobster threw some acid in Harvey Dent’s face mid-trial. Acid in the face? Too bad. Oh, well, what are you going to do, right? Well, if you’re Bruce Wayne you’re going to keep beating yourself up because you were actually there at court as Batman that day and leaped to protect your best good friend Harv. Alas, you failed, thus the shame and brooding. It presents more questions than it answers. How did Batman get into the courtroom? Did he arrive via tube, ala Futurama, since the film had earlier established that Bruce Wayne can apparently travel from his office at Wayne Enterprises to the bat cave via a trap door and an underground series of tubes? Or did he show up at court as Bruce Wayne and sneak into a bathroom to retrieve a strategically hidden bat-suit left for him by Alfred? If so, did seriously no one notice him re-enter the room looking like that? Or, since this is a point in his story where the police commissioner beckons him with a giant signal from atop police headquarters, is he just generally accepted wherever he pleases in the Gotham City justice system? Did the court have to beckon him with their own bat signal? Is this a new Law & Order phase of his crime-fighting career, where he both delivers the criminals to the authorities and then follows up at their court cases to bully and intimidate the bad guys? Is he just always sitting in the back of the courtroom, feet up on the aisle in front of him, reading a newspaper, perhaps with novelty glasses and a funny beard on over his mask to make people think he’s not Batman? Also, how did he know the mobster was about to throw that acid? Does he just periodically lunge at witnesses in anticipation of them doing something nefarious? It is just an incredibly stupid scene in a movie full of them. I probably could have also talked about when Robin shows how he hangs up clothes, i.e., with kung fu, or when the batmobile nonsensically drives up the side of a building. That being said, I don’t think the movie as a whole is horrible. It is not on the same level of the Tim Burton or Christopher Nolan films, but Batman Forever is a perfectly fine, campy comic book movie that has admittedly aged rather poorly. To its credit, it arguably attempts to do more with the character of Bruce Wayne than Tim Burton ever cared to. However, in its overall campier tone there are some things that make sense and some that don’t. For me, this quick origin story for Two-Face doesn’t make sense. Of course, when Christopher Nolan offered his own take on Two-Face in The Dark Knight he changed things up entirely. Out was the courtroom and a mobster and his acid and in was a gasoline tank and a building exploding. 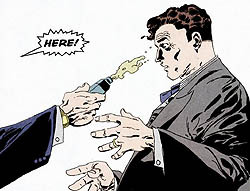 However, The Dark Knight is largely inspired by the iconic 1996/1997 graphic novel “The Long Halloween” which also tells an origin story for Two-Face. How do they do it? Yep, you guessed it – court room, trial, mobster, acid in face. The main departure from tradition is that Batman is not actually there when it happens. 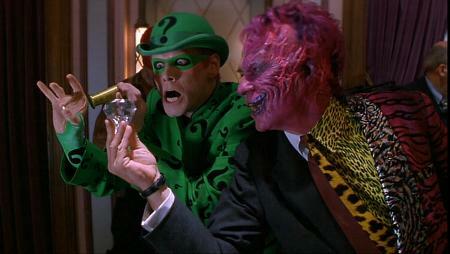 So, the Batman Forever scene in question has history on its side. Knowing that, I respect their intentions a little more. It still doesn’t stop me from chuckling every time I see the scene, though, because what works in a comic book does not always work in a film. Okay. This movie may have in fact aged far worse than I thought because that trailer makes the movie look horrible! Eh, I at least know that one scene with Batman in the court room is terrible. I hate that scene. Christopher Nolan paid homage to the original courtroom/acid in the face scene in The Dark Knight by having a mobster working for Maroni pull out a gun on him in court. Obviously, things play out differently but thought it was a nice nod. Agreed. That was a really cool homage in The Dark Knight, the type of easter egg which can please the comic book faithful but not alienate those who have no idea a classic comic book origin story is being subverted.